Social Media: Can we avoid it? 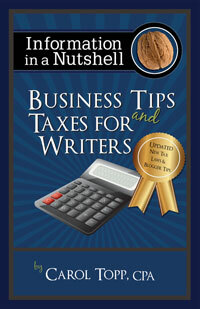 Carol hopes that writers see themselves are business owners. Through her presentation, attendees will better understand the business and tax terms they hear. They will also gain some practical ideas on how to blog or social media can be used. Supplies needed – bring a highlighter, paper, pen/pencil, laptop (full battery). Additional Services offered by Carol: Up to 6 private consultations after the event. This consultation will allow an author to bring their record keeping or tax return (or questions and/or other related business paperwork) and receive tips and advice from a professional. This consultation will allow for “more” private questions on taxes and record keeping that one may not want to discuss or ask in a Q & A session. Each consultation will be 20 minutes.